Dec. 9, 2014 1:00 a.m.
Itâ€™s easy to notice the bad things people do but Youâ€™ve Gotta Have Friends honoured three people for the good they do in the community. The fourth annual Community Builder Awards 2014 were presented at the YGHF Christmas Party Dec. 5. 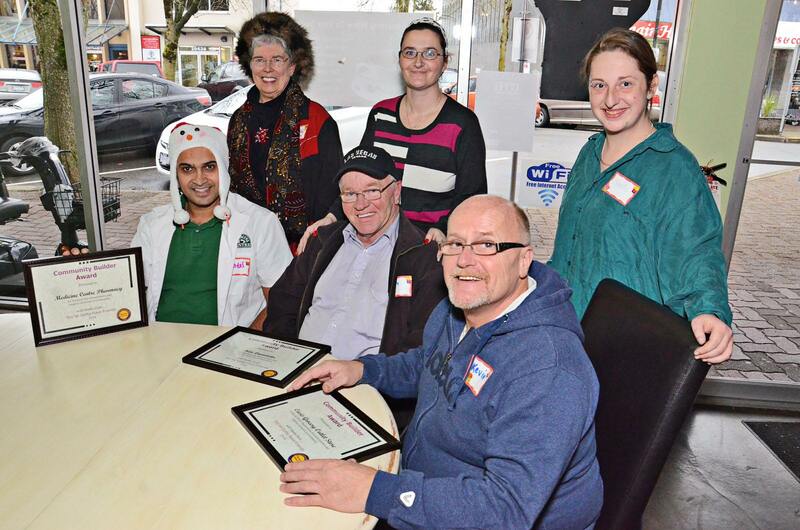 The three awards were to celebrate members of the community who demonstrate and inspire inclusion, build relationships, and contribute to the Langley community in some meaningful way. Papa Ken was chosen in the individual category. Connie Cornell nominated Ken Laviolette whom she calls Papa Ken. Kevin McNeil manages the Oasis Outreach Soceity grocery outlet. Volunteer Sadie Potosky nominated him. McNeil was described â€œgenerous, passionate and totally committed to offering access to affordable and healthy food choices to families, individuals and the elderly facing financial challenges in Langley. He treats people with kindness and respect often providing food at no cost, never turning anyone away without a bag or two of groceries,â€ McTaggart said when awarding him in the non-profit category. Pinder Mann and his Medicine Centre Pharmacy won the business category. Mann was nominated for Sandra Reams who praised the storeâ€™s welcoming atmosphere. YGHF has been in the community for several years. Its goal is to foster inclusivity for all members of the community. It recently created the Kindness Connects campaign where people seen doing good things are offered a sticker. YGHF also has other programs and initiatives such as Breakfast with Friends, Supper Club, Boppinâ€™ in the Park during summer, a Book Club, and coffee in the office in McBurney Lane.